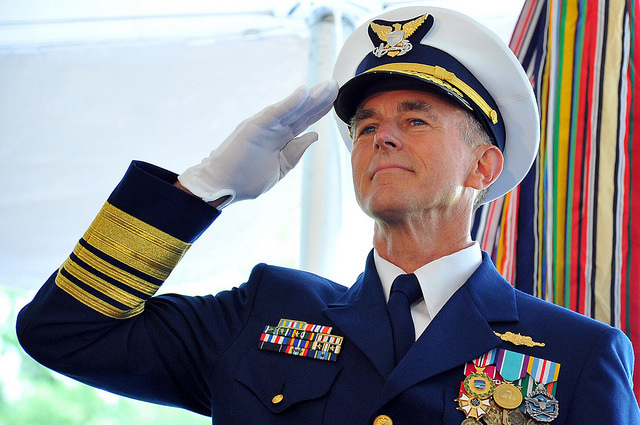 Admiral Paul Zukunft of the U.S. Coast Guard. Photo courtesy of Coast Guard News via Flickr Creative Commons. The United States Coast Guard gets overlooked often when we’re talking about the Armed Forces. At only about 40,000 members, it’s less than a fifteenth the size of the Army, or a twelfth of the Navy. But they’ve made their voices heard this week, in the days after Trump’s abrupt tweet about banning transgender service members from all branches. The commandant’s office reached out to all 13 members of the Coast Guard who have as yet officially come out as transgender, to personally assure them that the USGC would not turn its back on them. As of this writing, no guidance beyond the inflammatory tweets had been released by the Trump administration. But Zukunft’s statement directly refuted the tweet’s claims that trans service-members are a burden or a disruption. He’s not the only high-ranking officer to be on this side of the debacle. In total, 56 retired generals and admirals signed a letter from the Palm Center (a nonprofit dedicated to compiling statistics on LGBT people in service), pointing out that trans troops are already a part of the U.S. military, and have never been detrimental either to us, the UK, Israel, or any of the other 16 foreign nations which include them. Zukunft and his staff haven’t yet spoken of their plans to shield the USCG’s trans troops if the administration does proceed to an official anti-trans mandate, but it seems they can be trusted to do so. Hopefully, his stance will be an example to the heads of the other branches: the USCD has only 13 trans sailors. There are between 6,000 and 10,000 transgender members of the Army, Navy, and Air Force who have received no such offer.